Once a year prestigious Rikkyouin High School has a lottery to determine the next year's Student Council membership. On their first day of school Chihiro Enomoto wins the presidency while his childhood friend Tokino Akiyama picks the vice-president's ticket. There is one catch though, they must first pass a one year apprenticeship under the current Student Council and any failure to perform the tasks assigned, however minor, will result in immediate expulsion from the school. You all already know that this is a spinoff from a spinoff that was in Genshiken. Theres good reason why it was so popular among anime viewers and the fictional characters of Genshiken. The story is completely anime (meaning ridiculous) but gives this show recognition over others is having one of the most recognized tsundere character in anime history. As mentioned before, its story is quite ridiculous involving a lottery for student council candidacy and incurring expulsions for not fulfilling your duties in the student council. Throughout the show you'll experience pure slapstick, wackiness, and hijinks. Ninjas, mystery men and magic will all make their appearance in this show. But if you overlook the craziness that is Kujibiki Unbalance, you'll most likely have fun watching it. It pretty much covers all situations common in anime today. From harems, to banchos, to even a Coup d'&eacute;tat. The art is very basic but has its own unique style as compared to all the rest of the high school comedy's. The art works perfectly fine, even though they definitely don't look their age. But they do look cute and lovable. As for the settings you do get a feeling of depth and detail from all the camera angles they use for the show. The sound is basic as well with comedy sounds and and non intrusive background music. I did laugh at some of the sounds though like the pigeon crapping on Chihiro's shoe. Overall it gets the job done. The voice acting is all cute and moe and it covers all the different types of moe perfectly as well. For those who want to know what a true tsundere-type character is one doesn't need to look further than Ritsuko K&uuml;bel Kettenkrad. Everything about her is just plain cool from her looks to her attitude its just perfect. Add some other moe types like double personality, shy loli, and even a shrine maiden they do try to pull in such a large audience with their character types. I'm sure you'll find one that you love but Ritsuko definitely steals the show with all the hype behind her. Overall its a silly story filled with silly characters but you can't stand but to love this show its just all about having fun every episode and i believe it does it very well for being a spinoff of a spinoff. On a complete whim, I decided to check this series out this winter. 2006 is the year of the remake. The year featured remade versions of Demonbane, Kanon, Nobita's Dinosaur, Youkai Ningen Bem, and of course, Kujibiki Unbalance. Unless you truly watch way too much anime, you've probably heard of only two of those titles. Kujibiki Unbalance (2006) is a reincarnation of the OVA which itself is a realization of a fictional TV series in the series Genshiken. While the OVA was a lot of fun in paralleling the Genshiken universe, the 2006 series focuses on establishing the show on its own right. I went in expecting a typical third rate romantic comedy full of stock characters and a plot on the wrong side of the line between silly and stupid. What I got was a quite surprisingly enjoyable show with a satisfying ending and only occasional mishaps. The biggest surprise for me is that the story actually functioned and delivered a smooth, natural ending. I guess good things happen when you watch a show with low expectations. Kujibiki Unbalance takes place in the fictional prestigious Rikkyouin High School, whose student council (and even admission) is selected by lottery. This apparently works well since Rikkyouin is the top school in the nation in every way and its student council's power rivals that of some countries. Lo and behold our main protagonist Enomoto Chihiro (CV: Takimoto Fujiko) draws the lot for President and you can read the rest of the plot synopsis up top. Chihiro is a pretty unlucky guy and his motley crew of lucky future council members must essentially intern for a year before their inauguration. Kujibiki Unbalance works because it doesn't take itself too seriously and it's not afraid to have fun. This is undoubtedly a fun anime. Everything about the school, from its size, to its amenities, to the power of its council is absurd. The situations and assignments the future council members deal with are equally ridiculous, such as foiling an assassination attempt or breeding pandas. The show does not shy away from fan service, which is perfectly fine. The key is that the show did not overdo fan service and shift attention away from its other merits. By establishing a precedent of silliness and half-parody, the show is able to execute its plot to a believable extent. The student council candidates is a well balanced group of characters that complement each other nicely. Chihiro is the guy that is pretty dumb and untalented but has a good heart but terrible luck, Akiyama Tokino (CV: Nonaka Ai) is his childhood friend who is always positive and has incredible luck. Asagiri Koyuki (CV: Kojima Kazuko) is a sweet little good girl that everyone tends to overlook and Kamishakuji Renko (CV: Nishihara Kumiko) is a mad scientist and the attitude factor of the new student council. The current student council is equally well composed with Ritsuko Kettenkrad (CV: Koshimizu Ami) portrayed as cold and calculating. As the series progresses, this anime develops its characters and explores their pasts and their relationships. Wonders happen when a show does these things, especially if you have interesting characters. Kujibiki Unbalance has very simple cartoonish art. Regardless, the characters are well animated and brought to life. I personally like the character design better here compared to the OVA by Genco. The different art style plays a major role in differentiating this series from the OVA related to Genshiken, and minimalizing this show's relationship with Genshiken in general. The characters are well voiced, with a very strong cast led by Ai Nanoka (Fuura from Sayonara Zetsubou Sensei and Fuuko from Clannad), Ami Koshimizu (Tenma from School Rumble), Nogami Yukana (C.C. from Code Geass) and Yuko Goto (Mikuru from Haruhi). I enjoyed both OP and ED; specifically, Ai Nanoka and Ami Koshimizu do a great job with the ED, Harmonies*. Not without error, Kujibiki Unbalance can become blood curlingly cheesy or cliche occasionally, especially near the end. At times characters annoy you or act pointlessly. Regardless, Kujibiki Unbalance is solid. It's a simple 12 episode series with a simple plot and simple conflicts. It's not very ambitious but it knows what it has to work with. The romantic aspect of it is surprisingly not that bad, even well done, I would claim. All in all, this is a recommendation for people who enjoy some silliness and some fun with their schoolkids anime. honestly, didnt really like this anime very much. it just never really grabbed my attention and it felt like forever before i finally watched all the episodes.i was pretty happy to just be done it. i wasnt a huge fan of the story, and i think it had some of the worst art i have ever seen(almost to close to chibi, in my opinion) and the sound was ok i guess. the characters were a bit to childish and nieve. 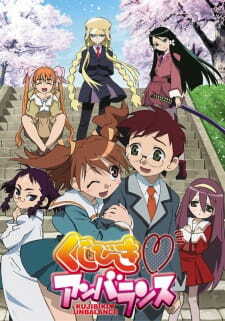 Kujibiki Unbalance (2006), an anime that can be appreciated specially by people who liked Genshiken and the Kujibiki Unbalance OVAs. Unfortunately, it's a lot different from what you would expect from the OVAs but the art is definitely better. It's not a &quot;must watch&quot; but I believe that it should be tried by people who liked Genshiken and the Kujibiki Unbalance OVAs, and also by people who would like to have some good laughs. The story is not much and the series is short, but it's not bad, it's &quot;s'orayt&quot;. Chihiro and Rit-chan are still childhood friends here and it still has the same Kujibiki, student council plot like in the OVAs. Other than that, everything else is different. The art is very good. The character designs actually pull down the art category because they're still unimpressive, with both good and disappointing changes, but it is a lot better than the OVAs though. The good ones here are the backgrounds, the coloring and the effects. These three factors make this anime look nice. The characters are the best point of this show. I only find it fun to watch because of them. They're all good, specially Chihiro's older sister. I'm pretty sure that because of her most viewers will like the show better when they reach episode 3.